Ryan August Warren was born in 1973 at Bess Kaiser Hospital on North Gantenbein in Portland, and was the final piece of our little family. Ryan came home to our home on 41st Street in Portland in time for Robin's birthday. Our third son was like adding about three to the family. Suddenly, there was not a whole parent per kid at any particular time. Ryan attended Bilquist Elementary, McLoughlin Junior High, and graduated from Rex Putnam High School in 1991. Like Ross, he had received a scholarship to attend the University of Oregon School of Music, and graduated in June of 1996 with a degree in Music Performance (Trumpet). During his high school years, Ryan won the state competition for trumpet twice (including his Freshman year, making him the second youngest winner of that competition since Doc Severenson). While at the U of O, Ryan was in the Oregon Marching Band and Green Garter Band (a full scholarship group), and we got to see him on national TV on Good Morning America and during the halftime show at the Rose Bowl in 1995. He has played with numerous groups, has had a number of trumpet students, and plays at church occasionally. On Christmas Eve, 2003, his church's Christmas service was televised nationally and we were able to see him play on TV again! Sarah Warren was born in Colorado in 1973 to George and JoAnn Burt. Her family moved to Keizer, Oregon where she attended Kennedy Elementary, Whitaker Junior High, and graduated in 1992 from McNary High School. She also attended U of O and graduated with a degree in Psychology in 1996. She also shared an interest in trumpet and played in the Marching Band. 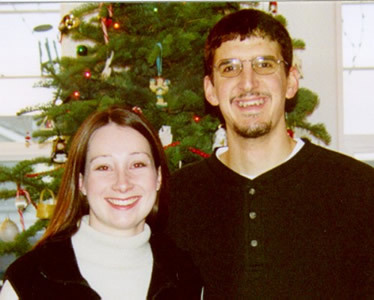 Of course, Ryan and Sarah met through their shared interest in music at the U of O.
Ryan and Sarah were married in 1997 at First Presbyterian Church in Salem, Oregon, and lived in Milwaukie, Oregon. After 3 years (2000), they bought their first home in Salem, which is where they currently live. Ryan currently works for the Oregon Department of Transportation in the Bond & Insurance unit, and is also an adjunct faculty member (teaching trumpet) at Western Baptist College and still teaches privately. Sarah was the director at Lambert House (an adult day care facility) of Volunteers of America for 6 years and is currently a stay at home mom. On May 16th, 2003, their first child, a son (and our second grandson) was born at the Salem Hospital. His name is Zachary Asher Warren. Ryan and Sarah enjoy spending time with Zach, going to Duck Football games, spending time with friends and family, teaching Sunday School, and working in their garden. On July 19, 2006, Ryan and Sarah's second child, a daughter (and our fifth granddaughter) was born at the Salem Hospital. Her name is Naomi Alexis Warren.